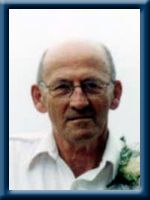 FISHER – Earl John, 80, of Port Mouton, Queens County, passed away peacefully in Queens General Hospital, Liverpool on Friday, February 28, 2014. Born in Port Mouton, he was a son of the late Vincent and Flora (Daury) Fisher. Earl was a self-employed fisherman for most of his working life. He was a former employee with C.W. MacLeod’s Fisheries, Nickerson Bros. and Steel and Engine Products Limited (STENPRO), Liverpool. Although retired from fishing, he stayed active in the fishery with his sons. He was also an active gardener in his spare time. He is survived by his wife Hazel (Allison), his daughters Karen (Lance) Roy of Liverpool, Brenda (Brian) McKinnon of Brooklyn, his sons: Brian (Leanora), Robin (Rosalyn Colp), Earl Jr. (Melanie Conrad), Marty (Shelley Heasman) and Donaldson (Felicia Roy-Fisher), all of Port Mouton, Eddie (Evelyn) of Milton. 16 grandchildren, 11 great-grandchildren and 3 great-great-grandchildren. His brother Ivan (Evelyn) of Shelburne. He was predeceased by his sister Edna Roy. Donaldson and family- I offer my condolences for your loss. May you take comfort in your fondest memories. I am so sorry to hear of Earls passing, my thoughts and prayers are with you all at this sad time. Those we love remain with us for love itself lives on, and cherished memories never fade because a loved one’s gone. Those we love can never be more that a thought apart. For as long there is a memory, they’ll live on in our hearts. We were so saddened to hear of Earl’s passing.Our condolences to all the family.Our thoughts and prayers are with you all at this sad time. We are saddened to hear of Earl’s passing. Please accept out condolences. Our thoughts are with all of you in this time of great loss. My thoughts and prayers are with you at this sad time of great loss. So very sorry to hear of Earl’s passing. He was a wonderful man. Our thoughts are with you at this difficult time and may you take comfort in the wonderful memories of him. dad is gone he will live forever in your hearts. So sorry to hear of Earl’s passing our thoughts and prayers are with you all. So sorry for your loss, may you treasure the memories. Hazel and family: We want to pass on our condolences in the passing of your beloved one. Ira worked with Earl years ago and spoke highly of working with Earl at CW McLeods. Sorry to hear of Earl’s passing. I will be keeping you and your family in prayer. I am so sorry to hear of Earls’ passing. Keep his memories close as they will bring you comfort in the difficult times ahead. My thoughts and prayers are with you. We are so sorry for the loss of your Dad.Our thoughts and prayers are with you all at this sad time.Keep the memories of him in your heart.He is at peace now. Sorry to hear of your Dads passing. Our deepest sympathy to you and your families at this time of your sorrow. Our thoughts and prayers our with you at this sad time. Sorry to hear about your loss. We wish Hazel and all the families the best. To the Fisher family I pass my condolence in the passing of Earl, especially Hazel, Eddie and Karen. My thoughts are with you at this time of sadness. I remember when my own father had passed away, it is not easy lossing a parent or partner in life. Remember him in kindness and all the good times, do not dwell in uphappy moments because they too shall pass. God bless the whole family and friends. To all the family; We would like to send our condolences to your family on the loss of your loved one. God Bless. So sorry to hear of Earl’s passing. He will be missed by all who knew him. Hazel & Families, So sorry to hear of Earl’s passing. Our thoughts and prayers are with you all during this sad and difficult time. Hazel and Family, We are sending condolences to everyone.Please remember that he is in GOD,S hands now and is not suffering anymore.We hope that knowing that he is with GOD that it will give you some peace. Love to all of you! So sorry to hear of Earl’s passing. Our thoughts and prayers are with you all. RIP Earl. Sorry to hear of Earl’s passing. He was a very private man who loved his family very much. My thoughts are with you at this difficult time. So sorry for your loss …..May god be with you …R.I.P. So sorry to hear of your Dads passing. Our sincere sympathy to you and your family. Our thoughts and prayers are with you at this sad time. We was so sadden to hear of Grampy Earl’s passing. To Nanny Hazel and the rest of the family you are all in our thoughts and prayers. To Earl’s family, we are sorry to hear of Earl’s passing. You are all in our thoughts and prayers. So sorry to hear of Earl’s passing. Thinking of you all during this difficult time. Hazel and Families….we were sorry to hear the passing of Earl…cherish the memories and keep them close to heart and they will bring you comfort in the days ahead…R.I.P. Earl. Dear Hazel and Families, I am so sorry to hear of your loss. You are all in my thoughts and prayers. RIP Earl. We were very sorry to hear of your loss. May your entire family take comfort in your memories of time together. May time heal your wounded and sad hearts. Earl left knowing there was alot of love surrounding him. Take care of yourself and each other at this time. Sincere sympathy on the loss of your Father, Earl. Marty, Stacey, Hazel and Families, we are thinking of you at this sad and difficult time. Earl was a wonderful man to everyone that new him. Our prayers and thoughts are with all of you at this very sad time. R.I.P Earl. To Earls family, we are sorry to hear of your loss. I am sure he will be missed by his many friends and family. Our sincere sympathy to the family during this difficult time. On the wings of the angels, and songs in the wind, the whispers of heaven, our memories will tend, to keep us till tomorrow when a new day will dawn and the roar of the ocean will be my love song. I haven’t really left you I’m far out to sea watching the heavens and waiting you to see for my boys are a lobstering and my girls are so strong and Hazel my darling I’ve loved you so long. So watch for the angels and listen closely and pray to the heavens and there you will see, I’m young and I happy I’m lobstering again and I wait for tomorrow to love you again. We are so very sorry for your loss he is in Gods hands now, Blessings to you all at this sad time in your lives. We were so sorry to hear about Earl. Thinking about you all at this difficult time. Hazel and Family, we were so sorry to hear of the passing of Earl. Remember all of the good times and this will help you get through this sad time. Beautiful tribute to a special father. May you find comfort in your many stories of his beautiful life and tremendous legacy. We hold you in our hearts. I am so sorry to hear of you great loss. Karen and family, We are so sorry for your loss, please accept our sincere sympathy ,may your Dad R.I.P. I am so sorry for your loss.He was a wonderful man.He loved everyone and judged no-one.He was a father to me for a long time and a great one at that.He will be missed by all that knew him!I’ll never forget some of his fishing and hunting stories he told us with such humour in them.I will never forget him. Hazel and Families, We are so sorry for your loss ,Earl was so loved by everyone and he shall never be forgotten. Take care. It was wonderful seeing all the pictures of Earl’s large family. We are fortunate to know some of them. We once read that a man is measured by the size of the smile on the face of his wife sitting beside him. The pictures confirm this. Though we barely knew him, we know this man will be greatly missed by his wife and all of his family. Please accept our deepest sympathy. Hazel and Family I am very sorry for your loss. I am so sorry for the passing of Uncle Earl. Though I am not just next door any more, I loved him and miss him as well. I pray that peace enters your heart, your love for uncle Earl lives there. Jesus loves us all, we may stray from the rightenous way of things but that’s the amazing thing of God, God forgives us for our sins. Read Acts in the Bible, it helped me with mom’s passing. Love you all!